Why Granite Counter Should Be Keep Clean? The secret to beautiful granite is merely keeping it clean agents original treatment with sealer. If granite deteriorates it is simply because it is cleaning has been neglected or harsh damaging cleaners have been used. When granite is neglected dirt and grease are allowed to accumulate. Therefore, the surface can be damaged almost beyond repair and cracks can be caused by generated deteriotation. Care and maintenance are important factors in guaranteeing a stone's lasting beauty. Stone are made of natural minerals and are differences in compressive strength, abrasive hardness, acid resistance, water absorption, ect. They may react adversely to cleaning chemicals. Particular varieties of natural stone consist mainly of calcium carbonate and very sensitive to acid. Therefore, fruit juices, wine and harsh chemicals must be removed immediatly from the surface of the stone. Do use coaster under glasses and use trivets or mats under hot dishes, chinaware, silver and other objects that could scratch the surfaces. Do clean your counter daily and inspect your counter time to time to ensure if your counter needs to be resealing. Do not use mixture of ammonia and bleach for removing stains. The result gas is toxic and lethal. Clean your countertop daily with a soft cloth and a neutral, non-abrasive cleanser for best results. Mild dish soap and warm water work best. Avoid products which are abrasive or contain lemon, vinegar, or other acids on any kind of natural stone. Sealer prevent the absorption of any compound that can stain your countertops, but is not stainproof. Any prolonged exposure of strong fluids such as wine, coffee, tea, tomato sauce, ect. may cause staining. Resealing depends on the type of stone you have and how much use your work surface gets. Sealant may need to be reapplied anywhere from 3 months and up.You can purchase the stone care kit and seal the countertop yourself. 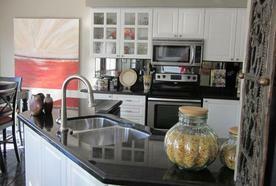 It is recomended that you hire a stone expert to seal your countertop every two to three years. Inspect your counter by pouring water on it, if the water absorb into the stone after a few mininutes, your countertop need to be reseal immediately.